It is what’s offered, how fast it’s delivered, and how well it’s supported that will make the difference in selecting a provider. 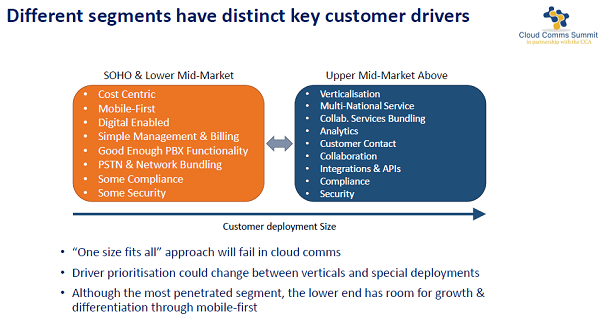 Based on what I read about the cloud communications market, it seems that the average customer has 10 to 20 seats. Small businesses are top adopters of the cloud, and not many providers have done a great job at capturing the medium and larger businesses. But as providers pursue larger business customers, it behooves them to look at the international market. I recently attended the Cloud Comms Summit, a conference put on in partnership with the Cloud Communications Alliance (CCA) that is focused on cloud communications service providers. At the event, Matthew Townend, director of research and consulting at Cavell Group, presented a keynote on the state of the cloud communications market, providing insight into the international market. The graphics in this blog are provided with permission of the Cavell Group. Based on what I read about cloud communications in the U.S., I would think that we should be leading the world in adoption -- but this is not true. It turns out that the Netherlands has a market penetration that exceeds 20% (see the chart below). 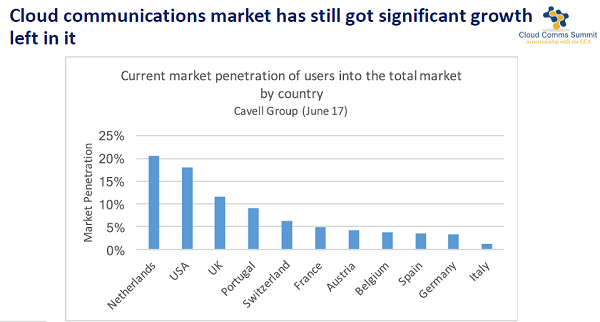 The U.S. comes in second with about 18% market penetration, and the U.K. follows with roughly 12% market penetration. When you review right side of the chart, you discover that Spain, Germany, and Italy have extremely low adoption rates. One of Townend's comments about Germany was that those businesses that have adopted cloud communications in that country on average have five seats or fewer supported. It appears that in many countries, very small businesses adopt cloud communications but when you look at larger enterprises, the adoption rate decreases. One of the conclusions Townend made about the market is that there is a lot of room in the international community for growth. Different countries have very different opinions about cloud communications. One of my own observations is that there are a number of international providers that are looking to the North American market for expansion. This means that North American-based providers should be looking at expanding their market internationally if they are to continue succeeding and growing. But cloud technologies do not recognize any geographic borders or boundaries, as Townend commented. He noted that as cloud services move beyond voice, the interest in multinational services increases. Another point is that smaller midmarket customers want to collaborate internationally. Townend concluded that European providers are investing in international services to grow their own markets. Another graphic from the keynote, shown below, contrasts the SOHO (small office/home office) and lower market drivers with the upper mid-market drivers. One of Townend's conclusions is that there is no one-size-fits-all approach. If a provider follows this path, they will likely fail. He further pointed out that the drivers are based on vertical markets and special deployments. I thought that Townend's graphic about SD-WAN, shown below, was important. He noted that SD-WAN service is commonly offered in the U.S. by cloud communications providers. SD-WAN has helped deliver improved services. 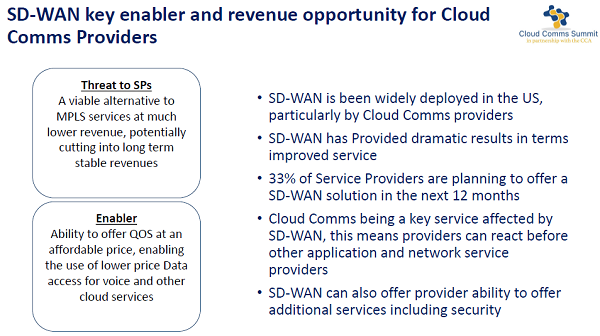 About one-third of the providers are planning to offer SD-WAN within the next year. He points out that SD-WAN is an alternative to MPLS and can be considered a threat to service providers offering MPLS services. Offering SD-WAN supports quality of service (QoS), which means that voice and other cloud services can be delivered at a lower price. As I listened to the speakers during the conference, I noted several conclusions. There is significant growth possible in the cloud communications market, especially in the international arena. Other event speakers talked about the ability to orchestrate services and deliver them much more rapidly. One speaker pointed out that the traditional approach where it takes 30 to 60 days to deliver service is no longer acceptable in today's world. Customers will go to another provider immediately. They are looking for delivery in less than 14 days, and some are looking for delivery in less than four days. It is what's offered, how fast it's delivered, and how well it's supported that will make the difference when businesses are selecting one cloud communications provider versus another.